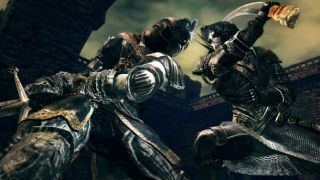 Dark Souls can be completed in a little less than 50 minutes, which is pretty staggering news for anyone who spent upwards of 100 hours struggling to beat it. The new speed run above, which clocks in at 49:55, was achieved by Twitch broadcaster Kahmul78. It's worth noting that faster speed runs have been achieved with the exploitation of a major bug (ie, the ability to glitch through a late game door) but this is a legitimate, no cheats run. According to Kahmul78 there's plenty of room for improvement over this run, which many will find hard to believe. Still, this is a guy who changes inventory during a plunge attack on an early game boss, so he's probably an authority on the issue. For those who have moved on to Dark Souls 2, that game will get a reissue in March packaging all DLC with some major tweaks to monster layout, among other things.